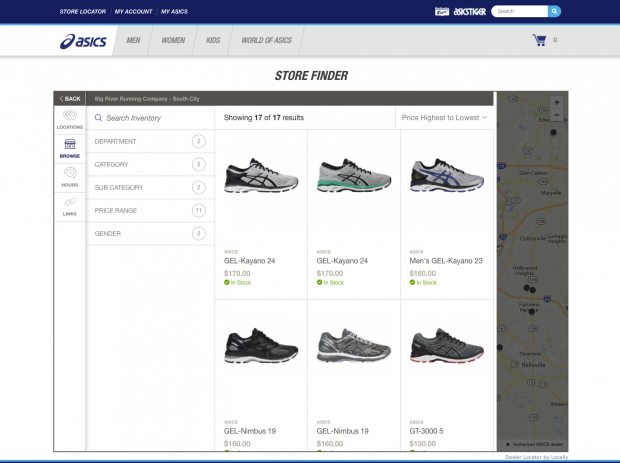 The new ASICS/Locally integration aggressively places stores at the center of their online experience. ASICS just launched Locally on Asics.com, putting local inventory squarely in the center of the shopper experience on the ASICS site. "Specialty retailers are an integral part of the ASICS brand" says AJ Andrassy, Sales Director, Run Specialty. "The Locally platform allows us the opportunity to demonstrate our continued commitment to this important channel. Locally provides our run specialty stores the ability to be listed as a location to purchase any product on ASICS.com It links to the geographically nearest specialty retailer partners and their inventory via ASICS.com. As a result, we are able to help get the consumers the products they want. It's a great blend with one of the best online and offline options to help serve shoppers looking for immediate gratification." Load any product page on ASICS' site, and you'll see a "Want it today?" Product Locator guiding you to the nearest stocking retailer. As of this writing, retailers in well over 400 cities in the US and Canada can see nearby availability directly on the product page, and even reserve or pay for items for in-store pickup. Try it out! Load the ASICS GEL-Kayano 24. If there's no inventory near you, try editing your location to Boston, MA, Naperville, IL, or St. Louis, MO for a few examples of the experience shoppers in some of the country's largest metro areas. One of the most popular pages on Asics.com- the dealer locator- is now powered by Locally. Locally's rich presentation allows shoppers to browse all available inventory at each participating retailer, and even reserve items for pickup. Try it out! Load the ASICS Dealer Locator and jump around to cities like New York, NY, Chicago, IL, St. Louis, MO, and Boston, MA to see dozens of examples of stores guiding shoppers directly to their in-stock selection. 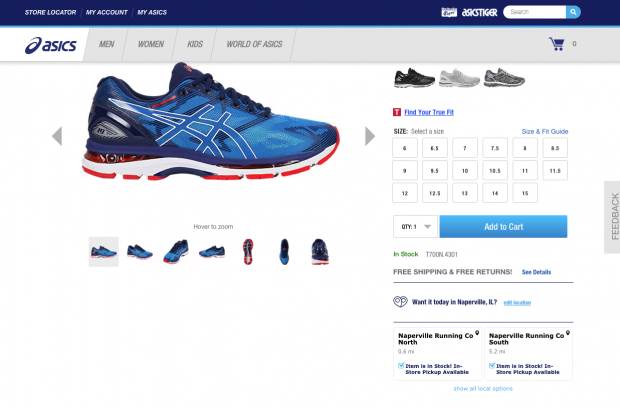 ASICS products are now also available for retailers to broadcast on their own websites and Facebook Pages via Locally's Locally Pages tools for retailers. Check it out! 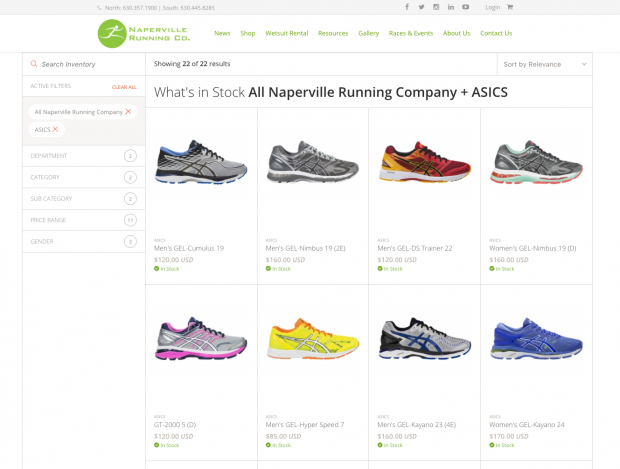 See how leading run specialty stores like Naperville Running Company, Big River Running, or Manhattan Running Company use Locally Pages to effortlessly show their site visitors their in-stock selection. If you're an ASICS dealer, it's time to get started driving traffic to your store by taking advantage of all Locally has to offer. Start by claiming your locally.com account by heading to retailers.locally.com and hitting "sign up." This puts you in control of your store profile on ASICS' website, and allows you to enhance your profile with your logo, hours, links, events, and more. Then, setup your free Locally inventory feed. Learn more about that here, and find step-by-step instructions for our most popular systems in our FAQ section. Need some help? Our retailer team is standing by waiting! Head to locally.com/contact to get in touch with us via your preferred method. Locally now officially powers Store Pages for 220 New Balance stores in the US and Canada with our premium tool, Shop In Shop.